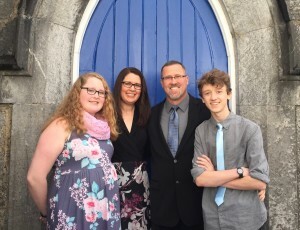 Darrin and Stacy Hausler, along with their children Toby and Emma, moved to Dallas in September 2011 to plant Dallas Foursquare Church. Darrin and Stacy had been in youth ministry for 16 years and Darrin served as the Youth and Associate Pastor of Newberg Foursquare Church for the last nine. Darrin always thought he would be a youth pastor for life, but in the fall of 2010 he felt the Lord call him to be a senior pastor. It has been a crazy and exciting journey that has brought Darrin and his family to Dallas. They are so excited to see how God is continuing to use Dallas Foursquare Church to partner with what He is doing through the other churches in this community.